According to data from a Demographic and Health Survey (DHS) that was conducted in Nigeria in 2003, 60.1% of all children of primary school age were attending primary school at the time of the survey. Among children of secondary school age, 35.1% were attending secondary school. These primary and secondary school net attendance rates hide the fact that many children are in school at a level that is not appropriate for their age. In Nigeria, children often enter school at an advanced age and leave school well past the official graduation age. The primary school age in Nigeria is 6 to 11 years and the secondary school age 12 to 17 years. 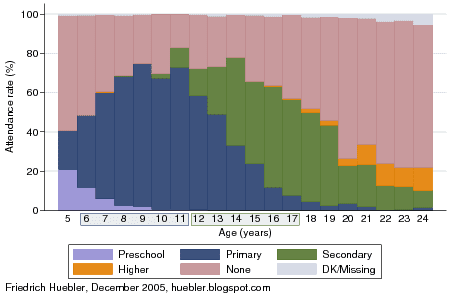 The graph below indicates the level of school attended for all Nigerians between 5 and 24 years of age. The data from the 2003 DHS survey reveals that a small percentage of Nigerians are still in primary school when they are already 20 years old. Secondary school attendance continues past 24 years of age, the highest age for which the DHS has data on current school attendance. Data source: Nigeria 2003 DHS. Only 36.6% of all 6-year-olds were attending primary school at the time of the survey. Primary school attendance reaches its peak between 9 and 11 years of age, when around 72% of all children are in primary school. At 17 years, the official graduation age from secondary school, 7.8% of all children were still in primary school. Among 12-year-olds, only 13.9% were attending secondary school, with other children just beginning to attend primary school. Secondary school attendance reaches its peak at 16 years of age, when 51.3% of all children are in secondary school. At 24 years, 8.7% of the population were still in secondary school. Delayed entry into the education system is a problem that exists in many other African countries. One indicator of this is that gross enrollment rates exceed net enrollment rates by a large margin in most of Sub-Saharan Africa. The repercussions of starting school late can be severe: such children are more likely to drop out from school and to enter the labor market with limited qualifications, reducing their potential to live productive lives. At the national level, having a less educated population makes it more difficult for countries to escape from poverty. Nigeria is therefore among the countries that are struggling to reach the Millennium Development Goals of universal primary education and eradication of extreme poverty and hunger. Interesting data. A link to the survey methodologies would be appreciated. Thanks. Imnakoya, the DHS surveys are described at www.measuredhs.com. You can also download the data for Nigeria from the site.